The first step for the Heat moving forward was to surprise much of the NBA world in bringing back Chris Bosh on a five-year, $118 million contract. This was a surprise because it was thought that Bosh seemed to be headed to the Rockets in what was all but a formality. Houston made moves such as trading Omer Asik to the Pelicans and specifically dealing Jeremy Lin to the Lakers to create the cap space to lure Bosh to town. But the Heat swooped in and signed Bosh to the aforementioned large contract, and it is not that hard to think why Bosh re-signed. First, he has $118 million reasons to keep his talents in South Beach. Second, Bosh seems to enjoy living in Miami and raising his young family there as well as enjoy playing for the Heat. If the guy is comfortable where he is, why leave? And for the Heat, they needed Bosh to come back. 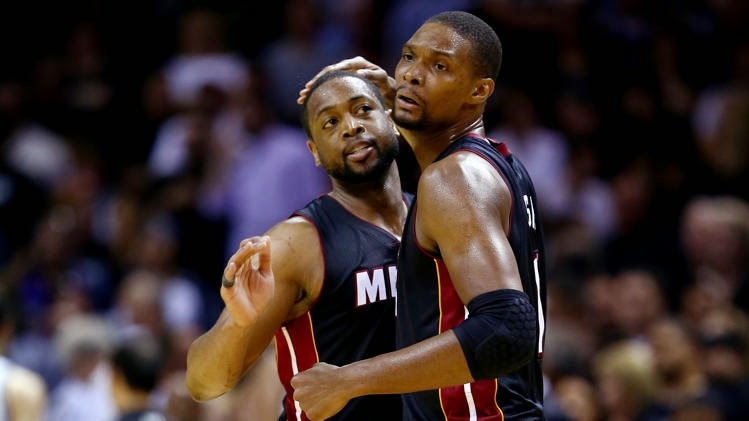 Had they lost Bosh, they would really be in trouble and perhaps that could have led Dwyane Wade to leave town and have the club truly be starting from scratch. Bosh is not the same player that he was in 2010 but he is still really good. He shoots very well from the perimeter for a big guy, defends his position well and is still a decent rebounder. People can hate on Bosh all they want, but anybody that tries to deny that he is not a very good player is fooling themselves. Speaking of Wade, even though there has been some rumored interest from the Bulls in luring him back to his hometown, all indications point to Wade returning to Miami. The thing with Wade is that while he is still a good two-guard, there is no question that he is in decline and you saw it last season. Miami rested him a ton in the regular season, sitting him for back-to-backs to save him for the postseason, and he was awful in the NBA Finals. But even then, Miami had to bring him back. The contracts that Bosh and presumably Wade will be receiving will likely look real bad in a few years, but Miami practically has to give those guys these contracts unless they wanted to fall into oblivion right away. The next step for Miami looks to be finding a replacement for James at the small forward position and it appears that Luol Deng will be that guy, as per Adrian Wojnarowski. I hope I am not shocking anybody by saying that it is a clear downgrade from James to Deng, but Deng is a solid NBA player in his own right. He is a tremendous defender, has a nice, versatile offensive game, and is widely thought to be one of the best teammates in the league. A Deng-Bosh combination at the forward position. Miami could still be on the lookout for a legitimate center and have Josh McRoberts, who is coming off a very nice season for the then-Bobcats, and Danny Granger coming to town as well. Of course, their respective contracts may have hindered Miami's flexibility to land pieces should they have re-signed James, but there is no turning back from that now. The Heat should (keyword: should) still be a playoff club in a mess of an Eastern Conference. Pat Riley is too smart of an NBA guy (although his moves the last two years have been rather questionable), Erik Spoelstra is too good of a coach and the team likely will have enough talent to ensure that they should be in the postseason this upcoming year, barring something unforeseen happening. But now the question has to be asked of when this franchise will have to start looking at some sort of a rebuilding process, and it perhaps may be closer than desired.